Stephane Bombet is a restaurateur who is known for partnering with excellent chefs, and Hanjip is no exception. Chef Chris Oh first appeared on our radar at food festivals with his Seoul Sausage Co., which won the Great American Food Truck Race. 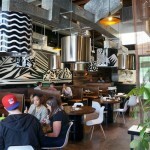 Following the success of his restaurants Escala and Nomad Kitchen, he has opened up a sleek Korean BBQ in Culver City. 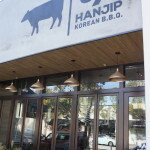 Hanjip means “one house,” and the intention here is to give it all to you under one roof — Korean BBQ, as well as fine dining fusion dishes. 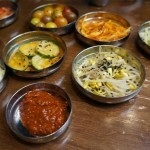 The restaurant service is traditional, with a variety of banchans being brought to the table, including bean sprouts, cucumber, cherry tomatoes and a very traditional fermented cabbage kimchi. They are meant to be eaten with the grilled meat, perhaps wrapped in lettuce or an aprilla leaf, but you can also snack on them. 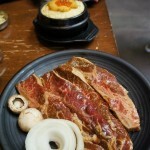 There is the standard grill in the center of the table. You can cook your own food, or a friendly and efficient server will take care of everything for you, cooking each meat on the proper grill. 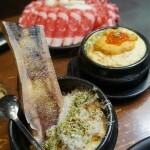 The menu offers a nice selection of raw dishes to grill at the table, pork belly, tongue, lamb, and even baby octopus, But really, it’s all about the beef. The brisket comes frozen into little tubes like at the Mongolian BBQ. 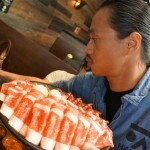 It cooks quickly to a melt-in-your-mouth tenderness. The short ribs are marinated and slightly sweet. We let them get a hint of char, and they were meaty and flavorful. But nothing prepared us for the tomahawk chop! It turns heads with its impressive size. 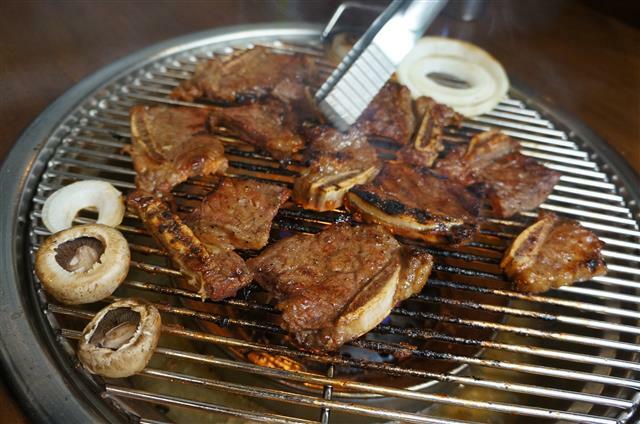 People stare as it is quickly seared on our grill. It is then taken back to the kitchen to finish in the oven. It returns sliced, completely covering a wooden tray. You can eat it so rare it is almost raw, or cook it for a few minutes on the BBQ. It’s almost impossible to describe the fatty rich, unctuous umami that fills you with every bite of this chop. 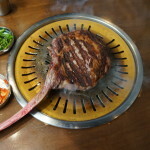 Even though it costs $150, the tomahawk chop can serve six people, so go for it if you want to cement your reputation forevermore as a serious baller. 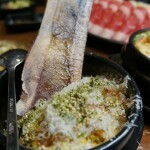 In addition to BBQ, there are a number of traditional dishes like katsu, bibimbap, and seafood pancake. 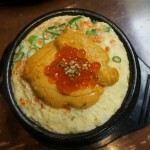 Some traditional dishes are given a special oomph, like the steamed egg with uni and caviar. The creamy texture of the egg and the uni make for a heavenly experience. Another fantastic dish was simple corn niblets elevated with Parmesan cheese, wispy webs of shaved bonito, and a marrow bone stuck right in the center. Let me just mention that the table is set with elegant metal chopsticks. 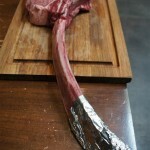 Metal chopsticks are much more slippery than wood. And there might be nothing harder to eat with chopsticks than delicate and slippery steamed egg and uni or tiny pieces of corn slick with bone marrow. Go ahead and ask for wood chopsticks; it is much easier. You can also ask for a fork, but I might pretend not to know you. All food and drink were complimentary. 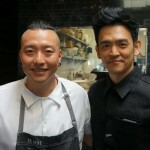 This entry was posted in Food and tagged best korean bbq, Chef Chris Oh, Chris Oh, culver city restaurants, hanjip, hanjip in culver city. Bookmark the permalink.